My library has seen a flood of thrillers/crime novels finding their way in and stuffing themselves on every last inch of space available on any shelf. The latest entry, sigh, belongs to the same genre. However, a saving grace of all these books have been, that they have taken me through different terrains, different sub genres of thriller-writing. 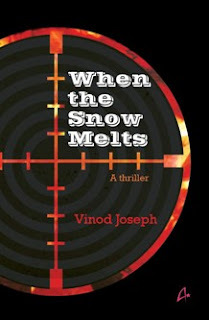 While the last thriller I reviewed was a medical mystery, and the book I am reviewing for this post had the promise of being an exciting spy novel - and exciting is only an understatement for what Vinod Joseph's book, 'When The Snow Melts' turned out to be. It is easy to give views on a piece of writing when as a reader, you are friendly with the subject matter contained there in. However, my knowledge of spy-activities and intelligence sharing is limited to Bond movies and Ludlum novels - which is a fair knowledge, I feel. However, no novel have I read which explores fictional topographies constructed out of intelligence activities carried out by Indian or Pakistans spies. Yes, I have seen Ek Tha Tiger, but please - stop! To even mention that overtly (ridiculously) romanticized tale in the review of When The Snow Melts is to do injustice to the great fun and thrill I experienced while reading this novel. In long, I came across a book which I just HAD to finish in one reading. Two readings, spread over 2 days, is what it eventually took. I would not say it is the greatest spy-fiction ever written by an Indian, the novel does have its lackadaisical moments, but overall, I can already let it out - this review will sing strong praises of the author Vinod Joseph. A little about the storyline before that. Ritwik Kumaris a veteran intelligence agent, who is working with Intelligence Assessment Group in London - a global terror fighting establishment where intelligence reports from across frontiers are pooled in to make the combat against terror outfits more cohesive and efficient. However, Ritwik is not quite the quintessential, invincible, extremely smart spy, who is all committed to the task of searching out Osama Bin Laden from his hideout in the hills of Afghanistan (well, that is what it was assumed for a long time, isn't it?) or purging the ISI, and the whole world, from fanatics and fundamentalists promoting violence in the name of religion. Ritwik is an alcoholic and gambler, snowed under debt, who defects over to nothing less than the al Qaeda! And from their begins the tale of finding his place in the midst of their ideological impositions, feeling titillations of a possible but forbidden love and saving not only himself, but his love interest from the way of fatal harm. Honestly, the reader will be quite clear after reading the first fifty pages what the eventual outcome of Ritwik's adventures in Al Qaeda-land will be, but the journey is truly worthwile. Vinod Joseph's novel is a treat for readers who like to get into the author's mind and attempt to stay a pace ahead of his narrative. A wee bit unfortunate is the fact that as a reader, I did win this race against the author many a times, but there were moments of unexpected revelations, which kept me on the edge and even made me shiver for a nanosecond perhaps. The glimpse that one gets into the world of diplomacy, intelligence-sharing, terrorists and fanatics in this book is quiet valuable. What is excellent is also the fact that the sub-plot of a love story is cleverly woven into the larger script, and not once does it overpower the actual genre-allegiance of this book - When The Snow Melts remains an interesting spy thriller, giving you something to chew on till the last page. Easy and intelligent use of language make the reading experience better. though I am not convinced with the plot as such. I would skip for time being !